Mail for me: Sweetscents order! - Cherry Colors - Cosmetics Heaven! Mail for me: Sweetscents order! On September 19th I decided to order the full jar (30g) of the Sweetscents Green Tea overnight rejuvenation powder. I already ordered the small one from a Slovenian site, but I wanted to stock up. I must say. Sweetscents has one of the best customer service ever! I emailed them to ask them about shipping and they offered me two possibilities. One for 13$ and another for 3$. I decided to try the 3$ one, but she told me she never shipped to Slovenia with that kind of shipping. But I could wait, that wasn't a problem. We agreed on that, and I paid in the same day. She was really kind, and would answer my emails right away, even if the next day she had surgery. She also told me, that she'll pick some samples for me. I was happy, of course. But I expected something like max. 5 samples. Oh boy. It got even better. Today, which is 10 days after she shipped the items, I got it. I mean, that's just insane! I paid lots of money on shipping, on other sites, and never, but never got my item from the USA in less than a month. But here, for the cheapest shipping possible, I got it in 10 days! That's amazing! Now lets move to the package (here it's already ripped open..): Everything so neatly packaged: Everything! : I couldn't believe my eyes. 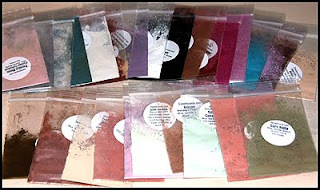 I got 30 samples (in a baggie) and 2 big samples!!! Wow, that's super generous! I think 10 of them were skin stuff. 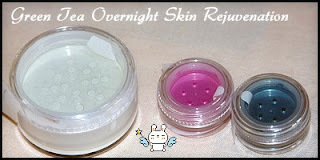 Like the Green Tea Rejuvenation for Dry skin, then Hide a pore, some nice finishing powder, concealers, blushers.. OMG! 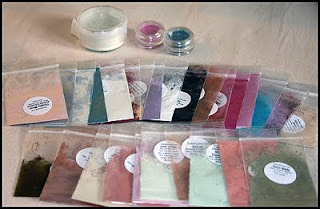 Now I will test them all, and then I'll order some items (I tried the finishing powder and hide a pore, and I LOVE them both!). 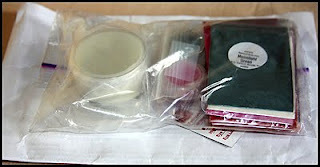 My order was actually just this big jar (now 50% off - less than 14$): All other items were freebies.. All I can say is WOW! So generous, and damn I love their customer service. Plus super fast shipping, and not to forget the most important. Product quality + price. Sweetscents site. P.S. For a couple of more days they have the Green Tea items discounted for 50%! (that means the green tea overnight rejuvenation, hide a pore, rice silk powder and bamboo silk powder). Next time I'll tell you what does the Green Tea Overnight rejuvenation powder.. (I'll give you just a hint for now.. It's great for pimples, left overs of touching them when you shouldn't and so on..) Do you know about Sweetscents? Ever tried it?